Happiness may seem elusive because we are not looking for it in the right places. 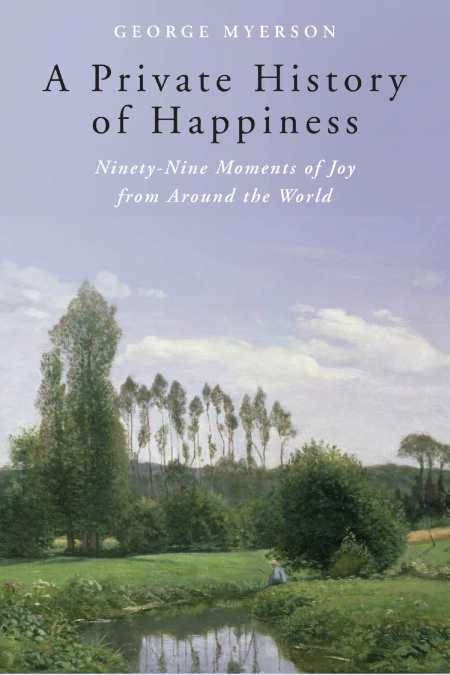 That is George Myerson’s premise in this inspiring compilation of ninety-nine excerpts about moments of joy described in personal writings in journals, letters to friends and relatives, and diary entries, as well as in memoirs, books, and poems. Divided by general topic— morning, friendship, garden, family, leisure, nature, food and drink, well-being, creativity, love, and evening—the brief extracts focus on life’s small events, such as a dinner party, plunging into a cold bath, snow-powdered trees on Christmas morning, and anticipating a visit from a friend. Through these examples, Myerson illustrates that happiness can be found all around us. The book will appeal across generations and geographic locations, as writers span eras and nationalities, providing a broad perspective. The writings are from centuries ago, with the most recent being from the late 1800s, and some of the earliest from Ptah-Hotep in 2400 BCE and Sappho in early sixth-century BCE. Yet, the experiences described remain relatable today, specifically because they focus on the daily activities and emotions of life, rather than grand events. Myerson’s interests in ancient and modern culture, as well as nature, are evident in the selections (he has also written several books on poets and philosophers, rhetoric, ecology, and the environment). Some selections are by well-known writers, such as John James Audubon, who describes hearing the song of the jackdaws through a foggy mist, and Leo Tolstoy, who recounts falling in love with a woman he met at a party. Other selections are by unknown or lesser-known writers, reinforcing Myerson’s notion that happiness is not something destined for a privileged few. Each entry follows a clear structure, beginning with the passage and followed by a thoroughly researched analysis from Myerson. By providing additional historical and social background about the writers, the eras they wrote in, and other cultural factors, he offers needed context. In some instances, his reflections lead to greater appreciation for the writer’s ability to find happiness in events that would be expected to cause pain or suffering, such as in the journal entry by Hannah Mary Rathbone, who describes her dying mother-in-law expressing love and affection for her family. In other essays, Myerson reinforces the delight writers express in the seemingly ordinary, as in a travel journal entry by George Head, an army officer and explorer, who describes the joy of ice skating. The more straightforward entries, such as one about cooking on the wagon trail, or the “peerless” plum, do not require as much additional background, and at times the analysis too closely restates the same details from the original work and becomes repetitive. However, writers will likely find Myerson’s detailed parsing of the word choices both interesting and instructive. In this uplifting collection, Myerson encourages readers to see happiness not as an unsolvable “riddle,” but as something that can be found in our everyday lives, if we are willing to take notice.